In a recent post (“My favourite eraser”) I wrote about the Faber-Castell 18 71 20 Dust-Free eraser. 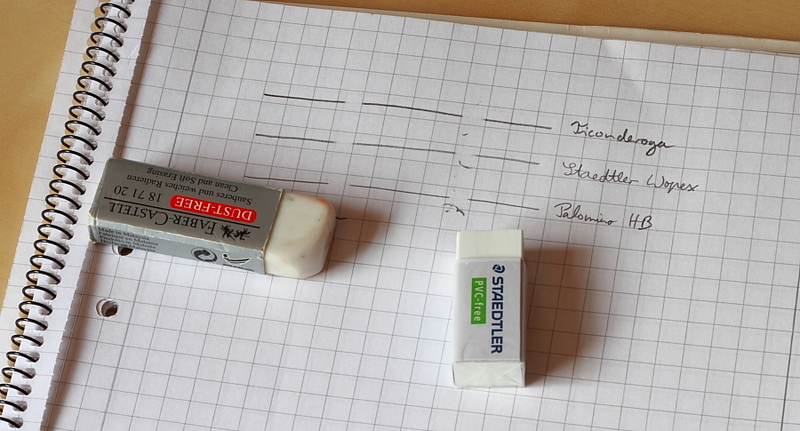 In a comment to this post Henrik mentioned Staedtler’s PVC free eraser, which he said is quite similar. Curios about the Staedtler’s performance I got hold of this eraser andoday I want to write a bit more about this eraser and about the Läufer Oval Office. What I like most about the recently reviewed Faber-Castell 18 71 20 Dust-Free eraser is that you only need to apply very little force when erasing and that it does erase very thoroughly, much better than most other erasers. To my surprise the material of the Taiwanese-made Staedtler 525 B30 PVC-free eraser seems to be even softer than that of Faber-Castell’s dust-free eraser. It is therefore also no surprise that you do need to apply more force when you use the Faber-Castell eraser. This might be down to the fact that when I compared them the Staedtler eraser was brand new, freshly unwrapped, while one of my Faber-Castells has seen a few months, the other one a few years of use and contact with air. Just like Faber-Castell’s eraser the Staedler is also available in two sizes: the model number of the big one ends with 20, the number of the smaller one ends with 30. Conclusion: The Staedtler is an exceptionally good eraser. It is not my favourite but comes very close. One disadvantage for me (others might not mind at all) is that the eraser waste does not twists up into strands, which makes it a bit more messy when you want to clean the paper and get rid of the eraser waste – but to be honest, for most erasers the waste does not twist up into strands, so this is nothing unusual. 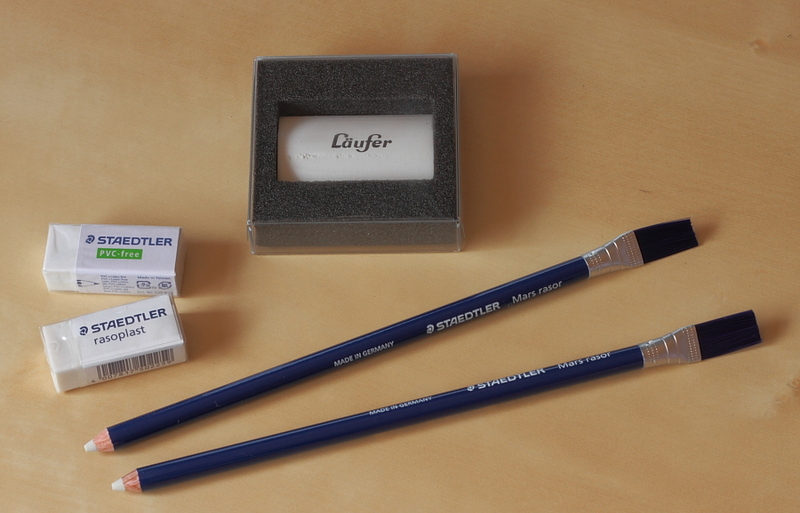 I bought the Staedtler 525 B30 in November 2010 for 47c (~62¢, ~38p). Läufer is relatively well known in Germany for their erasers. In 2004 Läufer merged with Gutenberg, a company some stationery fans might recognise because they supply indelible, permanent ink used for official documents – in Germany many dioceses and government offices use their G10 ink for official documents. As far as I know Läufer & Gutenberg are now part of Société Bic, the company that owns the BIC brand – but I have not been able to confirm this. The Läufer Oval Office is, in my opinion, an average eraser when it comes to perfermance and the material it is made of. It is mainly interesting because of it’s shape and that is also why I bought it. The Oval Office has the shape of a stretched lens. While the 90° angle of a traditional eraser will soon get too wide for erasing small areas, the shape of the Oval Office means that it can be used for more precise erasing for longer. Conclusion: A nice eraser I will use occasionally. The shape is practical and looks nice, but performance-wise I would describe this eraser as ‘normal’. I bought the Läufer Oval Office in November 2010 for € 1.69 (~$ 2.20, ~£ 1.40). The Staedtler Mars rasor you can see in the photos has been reviewed at pencil talk. I bought all three erasers in November 2010 from Schule-Uni-Shop. The Staedtler Mars rasor was € 1.37 (~$ 1.80, ~£ 1.15). Thank you for the enjoyable review. The “second tier” erasers from Staedtler and Faber-Castell seem to be well worth trying – but the use of these model numbers makes it challenging (at least for me) to keep track of which one is which. 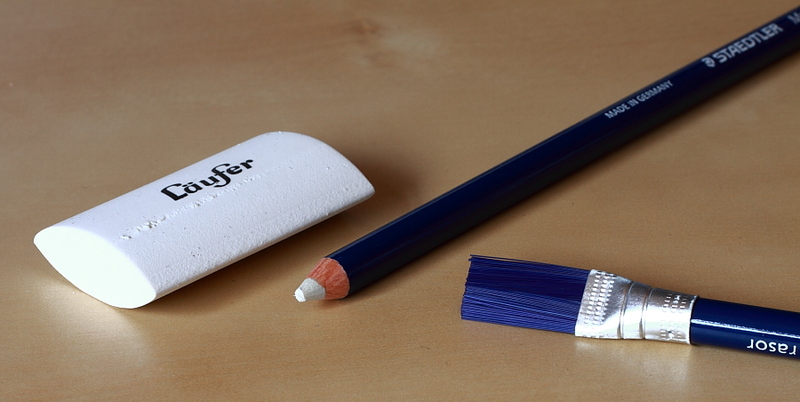 Läufer is not available in Canada, but I’ve used a couple of their erasers thanks to the Lexikaliker. They seem to be a first rate specialty company. I looked at the Schule-Uni-Shop site. Is that for wholesalers only? Amazing variety of products, but it seems not to be targeting individual buyers, unless I missed something. My high school German may be failing me. Stephen, the model numbers are really confusing and the only Staedtler eraser most shops in the UK seem to stock is the Mars eraser, which is a shame. I hope this is not down to the confusing model numbers.